Earth Quaker Action Team (EQAT) is not the kind of group you'd expect to break the resolve of the seventh largest U.S. bank, but that's what happened today when, after five years of our pressure, PNC released a policy phasing out their financing of companies engaged in mountaintop removal coal mining. This news is especially significant because it is such a classic David and Goliath story: EQAT with an annual budget of $100K vs. PNC with profits over $4.2 billion last year. Until now, PNC had invested hundreds of millions of dollars in companies that extract coal by blowing up mountains and dumping the debris in streams. By persistently and creatively challenging PNC's claims of being a "green bank," our scrappy grassroots group pressured them to effectively cease their investments in a controversial practice that contributes to both climate change and high rates of cancer in Appalachia. Founded five years ago by a small band of Philadelphia Quakers, EQAT (pronounced "equate") wanted to combat climate change by taking on the giant corporations profiting from dirty energy. Like the young shepherd in the famous biblical tale, we heard people tell us it was hopeless--and it would have been if we had kept to the old strategies of letter writing and polite protests. Just as David abandoned traditional armor and surprised his adversary with a sling and a stone, we realized we couldn't win unless we changed the rules of the game, though unlike David, our tactics would be nonviolent. As bestselling author Malcolm Gladwell argues in David and Goliath: Underdogs, Misfits, and the Art of Battling Giants, power isn't just a matter of size and muscle: "power can come in other forms as well--in breaking rules, in substituting speed and surprise for strength." Breaking the rules in surprising ways is EQAT's modus operandi. 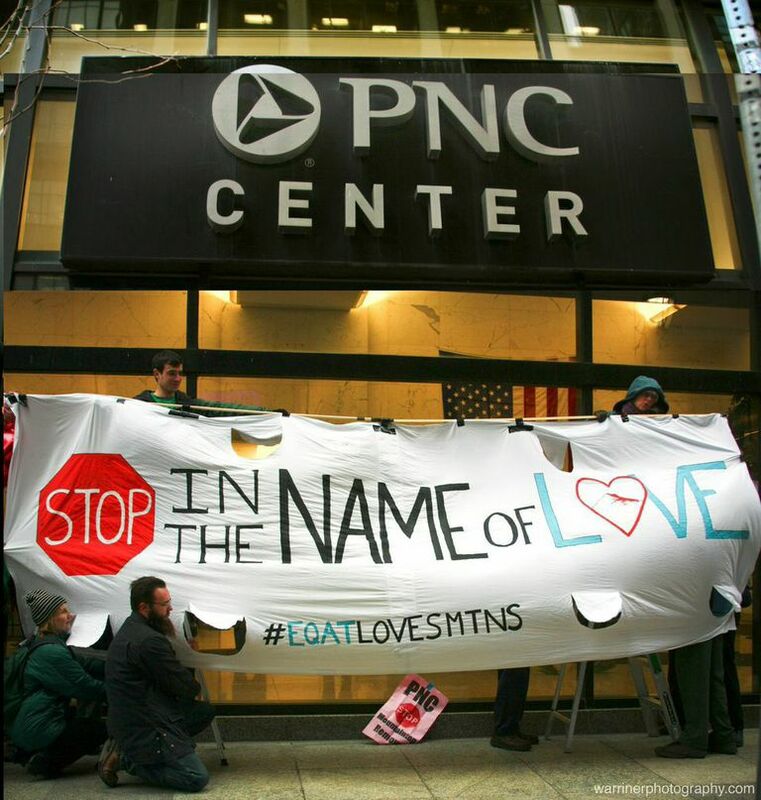 The first time I joined an EQAT action was at the 2011 Philadelphia Flower Show, where PNC was a major sponsor. Nine people stood in front of the PNC pavilion singing, "Where Have All the Flowers Gone," while security unsuccessfully attempted to distract the crowds. Nine months later, five EQAT members were arrested for trespassing after building ten-foot cardboard windmills in the lobby of the bank's Philadelphia regional headquarters. To escalate the pressure, in 2012 we walked 200 miles to the bank's corporate headquarters in Pittsburgh and told them that we'd be back, willing to risk arrest again if they didn't change their policy. When they refused to comment, we returned the following spring and sang the old union song "Which Side Are You On?" to each member of the PNC board in the middle of their 2013 shareholder meeting. They shut the meeting down in seventeen minutes. We also began challenging individual PNC leaders when they least expected it, like board member Jane Pepper who traveled to England to lead a garden tour and was met by British Quakers bearing chocolates and signs demanding PNC stop investing in mountaintop removal. Such bold tactics helped us grow over the past few years from a small band of Philadelphia Quakers to a multi-faith, intergenerational network that last December pulled off 31 actions against PNC in 13 states and the District of Columbia within 24 hours. PNC really didn't know what we would hurl at them next. Skeptics of nonviolent direct action will say that PNC's policy change was driven by economics--and that is partly true. Cheaper oil and natural gas have made coal a riskier investment, especially mountaintop removal mining, which has been under attack on multiple fronts. After years of refusing to comply with the Clean Water Act, in 2014 Alpha Natural Resources, which has been financed by PNC, was forced to pay a $27.5 million penalty and promise to start cleaning up their pollution from mountaintop removal. However, PNC themselves said the policy change was "driven by environmental and health concerns, as well as our risk appetite," and we know their attention to environmental and health concerns only came after five years of our challenging them on those issues. The broader demise of coal does reveal one important way in which Earth Quaker Action Team is unlike our biblical hero. David fought alone, whereas EQAT is part of a movement. Our Bank Like Appalachia Matters! campaign is just one part of the decades-long struggle against mountaintop removal coal mining, a struggle led by brave people in Appalachia who inspired us to take up this campaign. We are also part of the wider movement against all kinds of extreme energy extraction and climate change, the grassroots growth and prowess of which forced President Obama's veto of the Keystone XL Pipeline bill on February 24. The reason PNC's policy reversal is so important--in addition to further undermining the despicable practice of mountaintop removal--is that it proves that people working together can force the hand of even the biggest institutions. We've felt privileged to play a role in the larger movement led by the Appalachian people. This victory is for them and for all the groups who look small and weak next to a towering adversary. It's why people need to keep telling the David and Goliath story. As we fight to protect our communities and the climate, we all need to remember that, when we use unconventional tactics, ordinary people can win against giants. Sign a thank you to the frontline activists who inspired EQAT.